Artist David Rolt led a double life. For a living he painted portraits of celebrities. But his secret love was conducted outdoors, painting trees. English elms, Irish oaks, gnarled olive trees in Italy and rangy pines in the south of France, he painted their portraits wherever he found them. For Rolt trees could express as much emotion and spirituality as any human subject. He found it easier to sympathise with a beautiful tree than with many of the celebs whose portraits he had to paint for money. From September 16th-20th 2015 a special exhibition of David Rolt’s tree paintings is being held at Burgh House, New End Square, Hampstead, London NW3 . It will include many of his best oil paintings, watercolours and drawings painted in France, Ireland and the English countryside from the 1940s to 1980s. David Rolt was born in Yorkshire Born in 1916. From the early 1940s his treescapes – characterized by their bold line and use of colour – were being shown at the Royal Academy and New English Art Club. His work caught the eye of the leading London gallerist Sir Jack Baer, who staged five exhibitions Rolt’s work, which were followed by exhibitions in New York, Capetown and Istanbul. The success of these shows brought him many commissions, making Rolt one of London’s most sought-after portrait painters during the post-War years. His subjects came from from screen and stage, politics, business and high society. A close friend whom he painted many times was film star Valerie Hobson, wife of the politician Jack Profumo. But trees were the subject he constantly returned to. His landscape paintings, which typically feature windswept trees or rocky shores reflect the wildly fluctuating emotional climate of the artist’s life, sometimes sun-drenched, sometimes wintry-bleak. 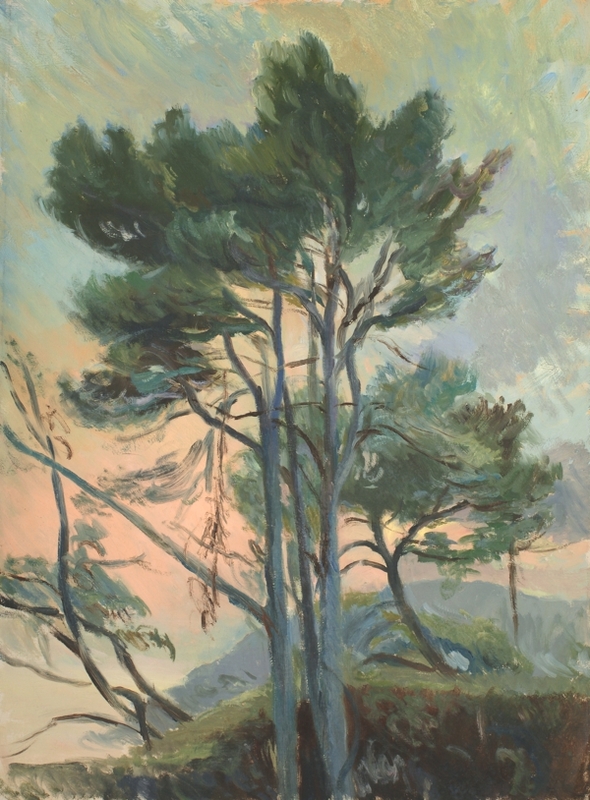 When he was in France the sandy pine trees of Cap Ferrat were a favourite subject. In England the great elm trees near his homes in Berkshire and Oxfordshire would become a regular subject when Dutch elm disease threatened their existence. David Rolt died in 1985; a memorial exhibition was held in London the following year. The paintings featured in Treescapes are from the artist’s own studio collection. Robert Eagle Fine Art is a new venture devoted to the work of artists, especially British and Irish artists of the 20th century, who deserve wider recognition. Working as an online gallery we aim to keep prices for our customers as affordable as possible. But if you are interested in a work of art, we expect that you will want to view it for yourself at our private gallery in Chiswick, West London.